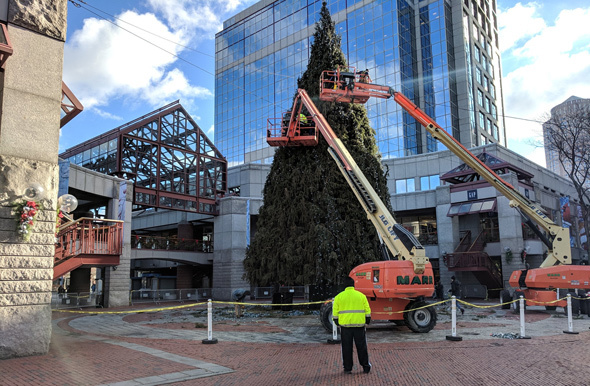 Ashish Kasturia said good bye to the giant Christmas tree at Faneuil Hall Marketplace today. This week and next, Boston will pick up residents' un-decorated Christmas trees on their recycling days. 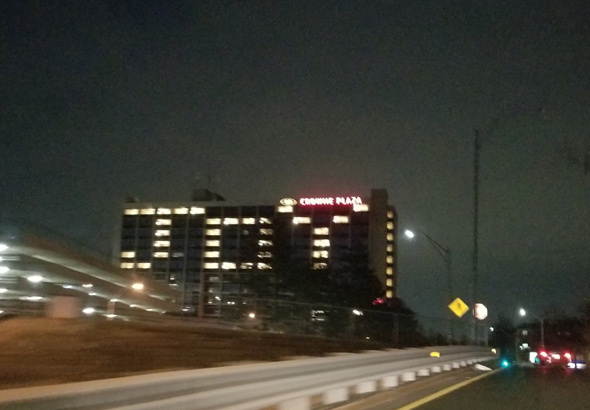 Kate couldn't help but notice the way the Crowne Plaza was lit up in Newton Corner over the turnpike tonight. 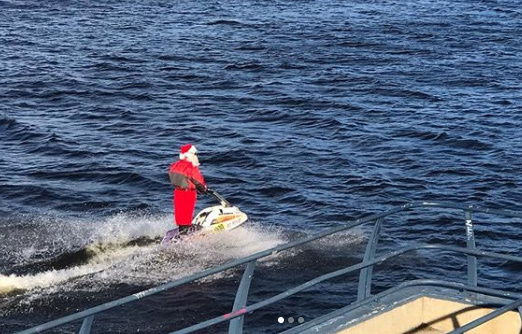 Why, yes, that was Santa dashing through the Charles by the Esplanade today, as captured by Rob Colonna. 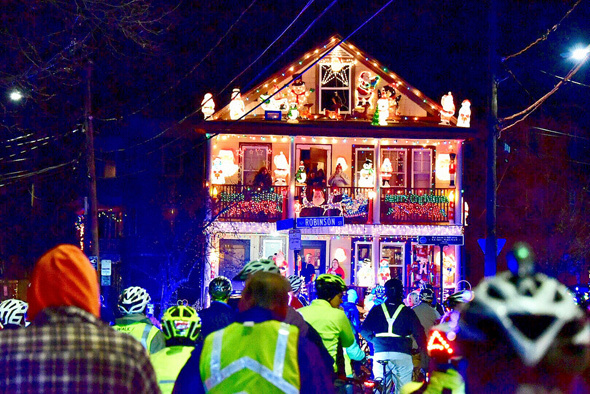 Brad Kelly went on the annual Somerville Illuminations Ride the other night. Copyright Brad Kelly. Posted in the Universal Hub pool on Flickr. WMFO, 91.5 FM in Medford, played two straight hours of "Baby, It's Cold Outside" this morning - including the versions by Leon Redbone and Zooey Deschanel and Michael Buble and Miss Piggy. H/t Ron Newman for noticing, since here at UHub World Headquarters, we get WMLN in Milton on 91.5. 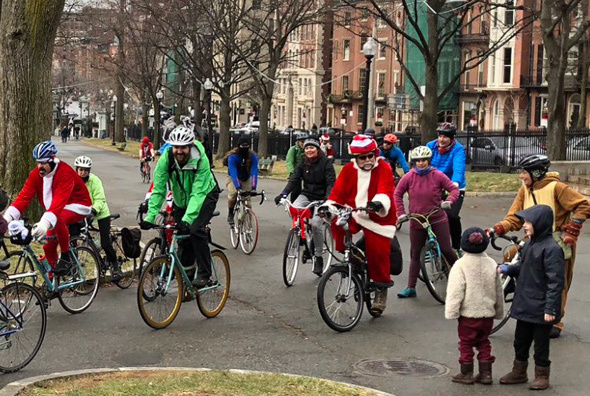 Steven D. Schmitt watched a Christmas bike parade through the Common today. But where were his reindeer? Over in Somerville for the Jingle Bell 5K: Read more. From the WBCN oldies collection. Rudolph with your nose so bright, won't you guide my sloop tonight? 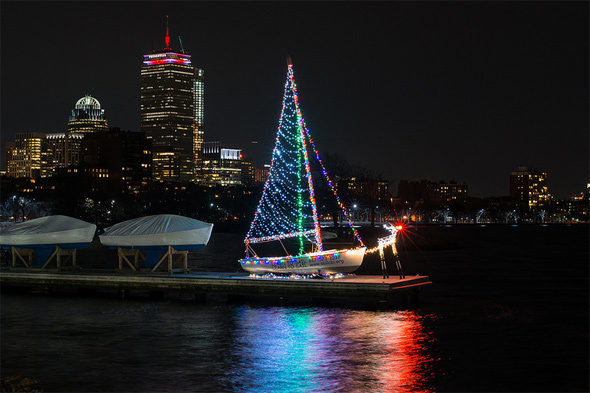 Acraftymitch photographed Boston on a cold night tonight, including Community Boating's Christmas boat on the Charles. Adam Castiglioni watched Santa land in the North End today. 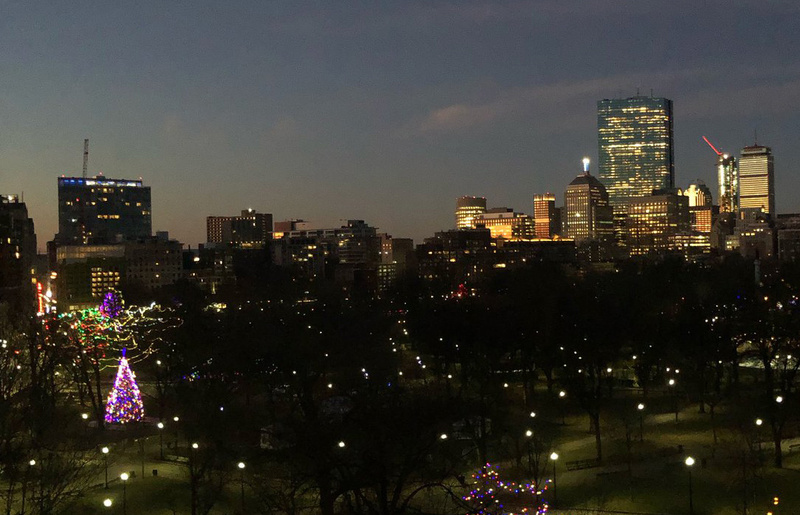 Louise Miller got a dawn look today at the Nova Scotia Christmas Tree on Boston Common - lit up last night - and the towers of the Back Bay. And, big news this year, it will feature colored lights. 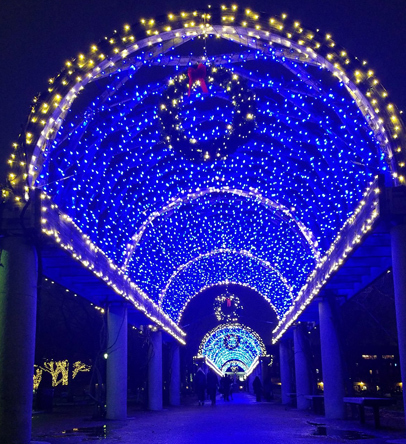 Petra A. wandered around Christopher Columbus Park and Faneuil Hall Marketplace this evening. 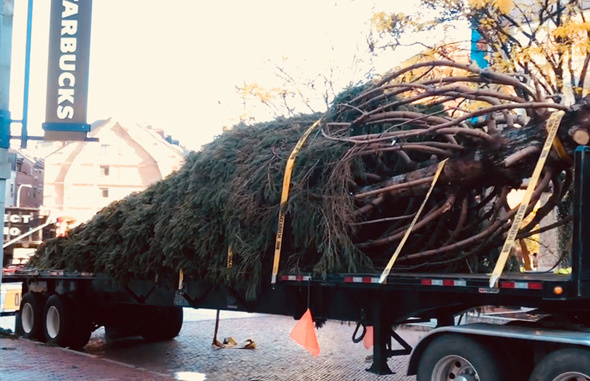 CarCarli spotted the Faneuil Hall Marketplace Christmas tree arriving this morning. Thomas Lawson, a native of Charlestown, was not well liked on Wall Street back in the day. 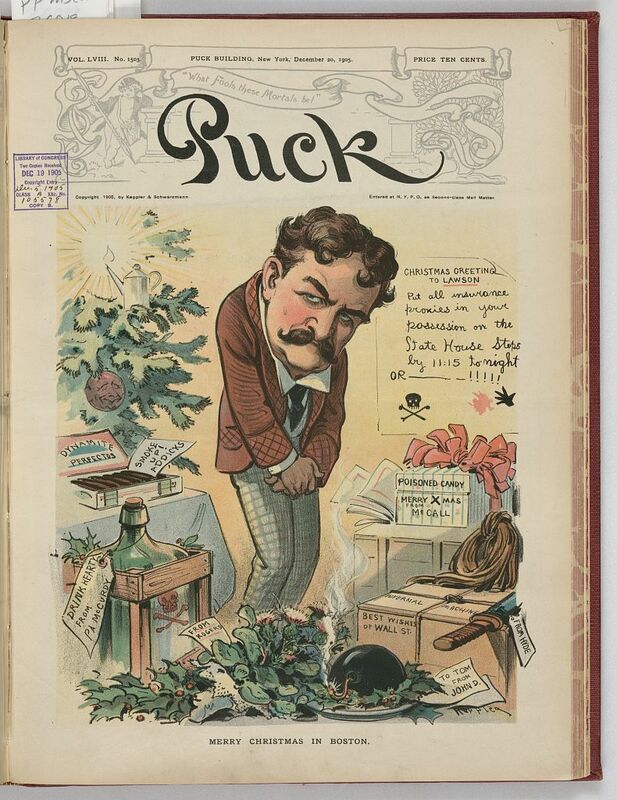 Lawson, who started working as a bank clerk after he ran away from home at 12, became rich as a speculator in copper stocks, but later tried to reform Wall Street, which, as you can see from this 1905 cover of Puck magazine, did not much appreciate the attention. Read more. John Gage watched the sun go down over the water and Boston this Christmas eve. He wasn't alone: Read more. Mark watched the School of Honk jamming on the Common this evening. Mark watched some carolers on the Common in the freezing rain tonight. Read more. "Meanest MBTA ferry customer I have ever shared a shared a boat with," Nathan Peyton reports. Eileen Murphy reports the Valentine's Day stuff is already beginning to crowd the Christmas stuff at one South Boston store.